Did you see these UFOs over Telford? 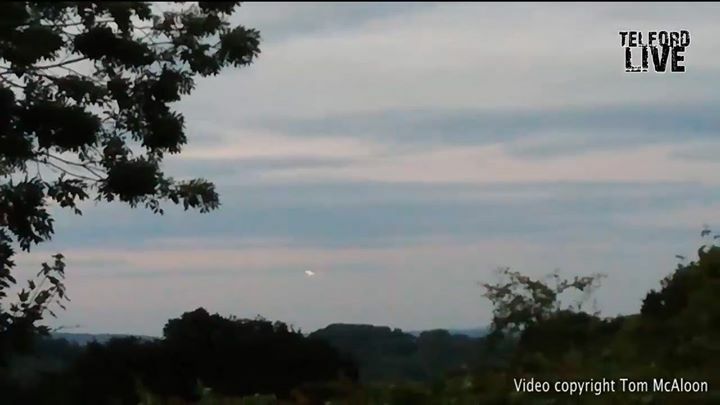 As Tom McAloon looked across the Gorge from his home in Broseley, he spotted something unusual in the sky over Halesfield. A series of lights appeared and started to move in a circular motion, defying any rational explanation. Tom said ‘long long time ago seen a few strange things in the sky’s over Scotland’ but nothing like this in Shropshire. Filming on his smartphone, one of the orbs seems to move in a circle, throwing out sparks or chaff, ruling out a fixed wing aircraft. What’s your explanation for this phenomena? They had the model aircraft up at cosford over the weekend and some have been flying with fireworks on their wings. It was around 1981 and a summer’s evening… me and some friends were playing in the trees on the field next to the TA centre in Trench. Then all of a sudden what can only be described as a flying “fridge” appeared over the army depot. It hovered on the other side of the fence to us. It was quite high up, or appeared to be, and there was about 6 or 7 of us all stood there staring at it wondering what the hell it was? I was about 12 and had never seen anything like it. I have no idea what it was; whether it was “watching” us? It wasn’t a plane or helicopter. Drones hadn’t been invented then. After a few minutes of hovering back and forth in silence it suddenly shot off at speed towards Donnington, and I mean “speed”!! It was like “woosh”!! Gone in an instant! Once it had gone we just carried on mucking around in the field and never thought anymore of it. The next day my Dad came home from work and asked “Did you see anything while you were out playing yesterday?”… I told him what we’d seen, and he said someone he worked with in Leegomery had seen something strange over his house the night before… exactly what we’d seen… a huge metal box-like “fridge” flying over the house! Never did find out anymore, but in the 90s I was watching a programme about UFOs on cable tv and there was a video someone had filmed over Mexico City showing what looked like exactly what I had seen a few years before! Weird, but interesting nevertheless.